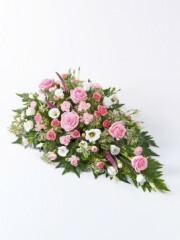 Ellon Flowers are proud to offer you a variety of spray and sheaves as Funeral flowers. The range that we have on offer guarantee that there will be something to cater for many different tastes. Whatever you’re looking for, you can count on the florists in Ellon to provide tasteful and classic spray or sheaves to add a dignified beauty to your Funeral flowers. Flowers Ellon is able to provide a fantastic local flower delivery service, meaning that your order is in safe hands. Furthermore, as part of the Interflora brand we are also able to deliver spray and sheaves all over the UK. The florists in Ellon would like you to know that distance isn’t an issue, as we can also offer international flower delivery service in 140 countries across the world, so wherever you may be you can still order beautiful flowers. The hardworking team at Ellon Flowers are dedicated to making your order as simple and easy as possible, which is why we carefully oversee your purchase throughout every step of its journey. If you have any queries concerning your order you should not hesitate to contact our friendly and approachable team who would be delighted to help you in any way possible. Ellon florists have 40 years of experience in the floristry industry, which means your spray or sheaves are in good hands. The florists would also be happy to provide any advice you may need about your order of Funeral flowers. You can always count on Flowers Ellon to provide a fantastic customer service experience and to deliver your order safely and efficiently. Here at Ellon flower delivery we keep careful track of your order until it has been successfully delivered. If you are looking for tasteful and respectful spray or sheaves, look no further than Ellon Flowers to provide you with everything you need. Our priority is ensuring your order is simple and easy, which is why purchasing Funeral flowers with our florists in Ellon is an excellent decision. Here at Ellon Flowers we have a beautiful range of spray and sheaves for funerals. Tasteful, simple and elegant, they are perfect for any funeral. Our wide range guarantees that there is a stylish arrangement to suit everyone. If you are looking for graceful simplicity, the Calla lily sheaf is a classic yet beautiful option. Ellon florists also offer white lily sheaves and simple rose sheaves to add a heartfelt touch to any funeral proceeding. If you are looking perhaps more colourful or complex, but nevertheless tasteful, Ellon flower delivery can provide a classic sheaf, a pink, white and lilac spray or a woodland spray. These options are sure to please everyone, and are classic favourites which add a subtle beauty to your Funeral flowers. The Carnation and Gemini teardrop spray is a truly stunning choice for a funeral and are of the highest quality. The florists in Ellon aim to match fantastic quality to affordable prices, meaning that purchasing your funeral flowers from us is a worthwhile decision. Ellon flower delivery is also able to offer a same day delivery service if your order is placed before 3pm, meaning that you can rely on us to have you funeral flowers delivered on time. Here at Ellon Flowers we aim to make your delivery as satisfying as possible, and you can rely on us to provide you with beautiful Funeral flowers. The unique service we provide will ensure that your order of funeral flowers with Ellon florists will leave you completely satisfied.